The AUTOPULSE Z-20 offers big panel advantages at a lower cost for single and multiple hazard applications offering 100-250 addressable point capability and up to 32 points of conventional zones. 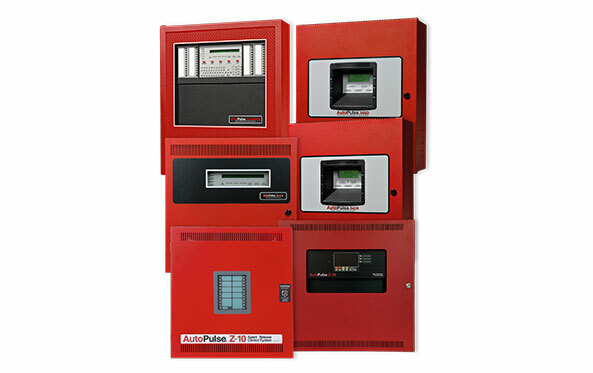 The Z-20 panel features templates designed to simplify fire suppression appliation programming, a USB port to upload programs or download critical information such as historical logs, and a 4.3-inch color touch-screen display and intuitive menu-driven interface. The AUTOPULSE IQ-318(C) and IQ-318(E) Agent Releasing Control Panels are designed with modularity and easy system planning. They can be configured with just a few devices for small building applications or for a large campus or high-rise application. Simply add additional peripheral equipment to suit the application. High-efficiency offline switching 3.0 amp power supply (6.0 A in alarm): 120 VAC (IQ-318, IQ-318C) or 240 VAC (IQ-318E). The AUTOPULSE IQ-636X-2(C) and IQ-636X-2(E) Agent Releasing Control Panels are designed with modularity and easy system planning. The panels can be configured with just a few devices for small building applications or for a large campus or high-rise application. Simply add additional peripheral equipment to suit the application. High-efficiency offline switching 3.0 amp power supply (6.0 A in alarm): 120 VAC (IQ-636X-2) or 240 VAC (IQ-636X-2E).